I'm delighted to be featured in VoyageChicago's Thought Provoker series. Here's how I got from healthcare to my creative practice! Today we’d like to introduce you to Heather Hancock. I always say that art chose me. It found me working in healthcare; pouring all my creativity into helping others “live well.” With a Master of Science in communication disorders, I worked first as a speech language pathologist and then as an administrator in physical rehabilitation programs in Chicago hospitals. During my decade-long career in healthcare I came to understand the importance of our physical surroundings to our well-being. I saw how perfectly the natural world engages us. I started to think about how this kind of dynamic and information-rich beauty could be brought into interior spaces. I encountered ancient glass installations while traveling in Europe. 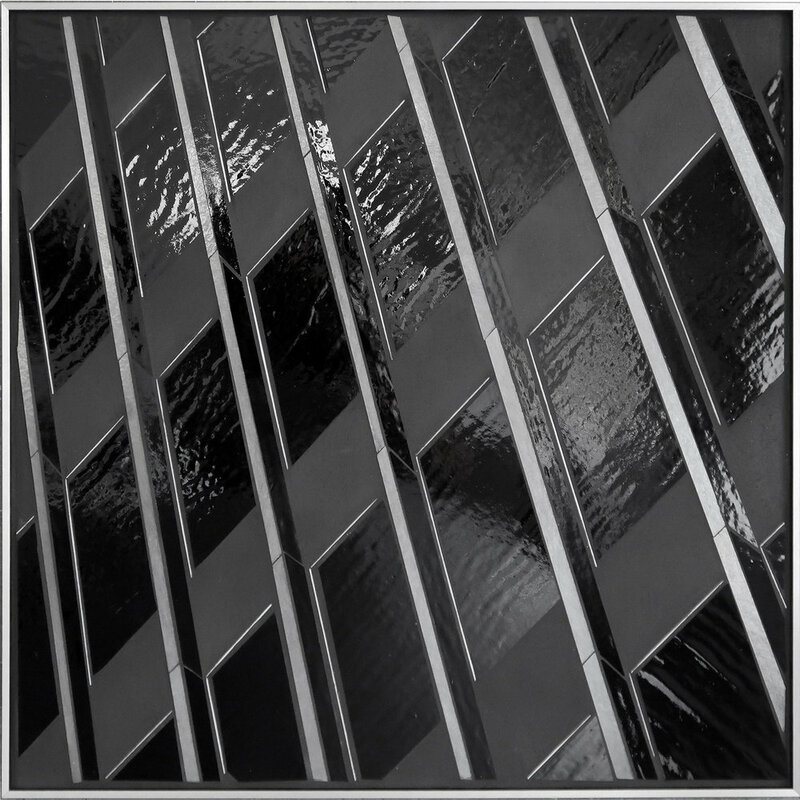 I was immediately captivated by how shimmering glass brings imagery to life. I could start to envision a way to bring bold and unexpected visual experience into interior spaces. And so began my 15-year journey with glass. I work with glass to create visual experience. I’m always working to get a 2D art piece to function as a dynamic art object, one that catches light and transforms with a viewer’s movement. The visual experience is infinitely variable. My inspirations come from everyday moments where the natural world and built world intersect. Alongside the hard lines and repetitive forms of our cityscape, I notice the fluidity and constant transformations in our natural world. These moments fascinate me and I try to re-create them in my work. Right now, I’m exploring urban form and rhythm abstracted from architecture and text. 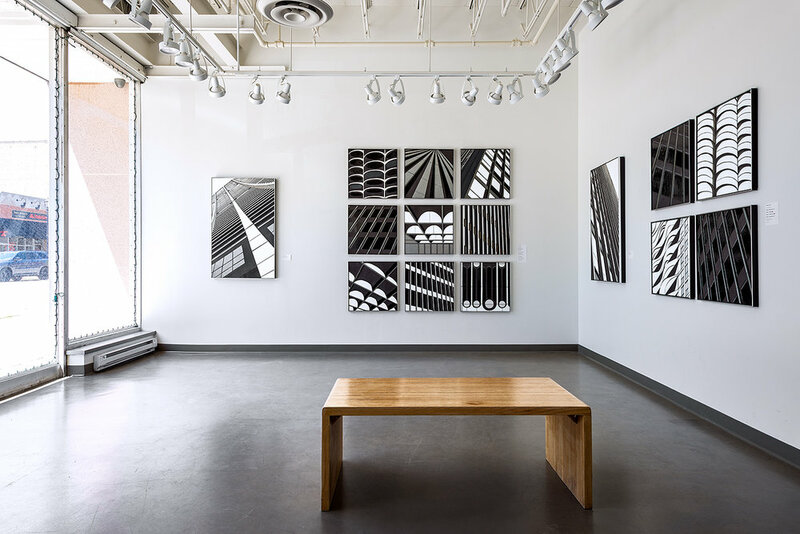 One series, Reflect, explores urban beauty. Glass is everywhere in our city. 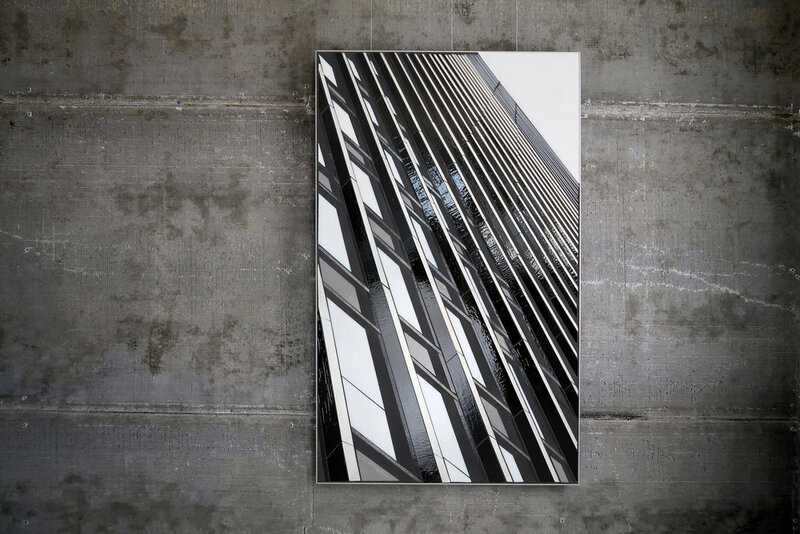 It catches light, reflects the sky and animates our streetscapes. Reflect is inspired by this overlooked urban beauty. I think that living well in urban settings requires new ways of seeing beauty and staying connected with the natural world. It’s an exciting time to be developing a creative practice. There’s widespread interest in designing live and work spaces that help people thrive. I’m working with art consultants, designers and architects around the country who see art as a key element in creating compelling spaces. As an interdisciplinary artist drawing on my background in neuroscience I love this interest in art that has both aesthetic and conceptual impact. I know art has the power to catch our attention, make us think, help us notice everyday moments. Being a participant in that experience is what it’s all about for me as an artist. I define success as engaging a viewer in dialogue with a piece. The visual narrative of my art offers the kind of beauty and engagement that helps us live well in our everyday spaces. My work is meant to be experienced in person. It’s hard to capture the vitality of glass in still images. I love having people come by the studio to see work in person. 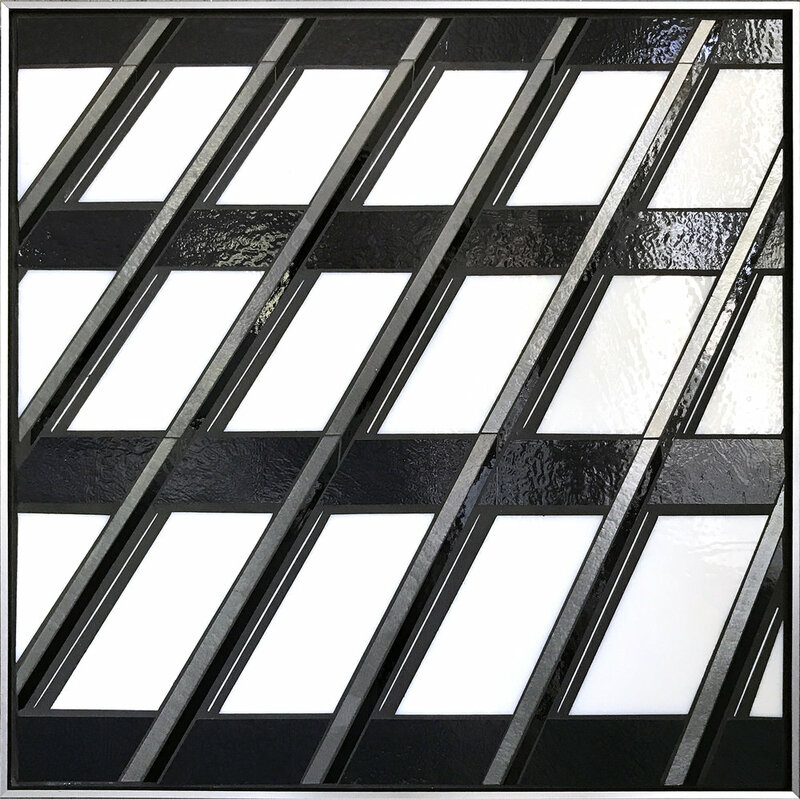 Not only can you see finished pieces and how they interact with light and movement, but I can also give you a look at the engineering behind the work, from substrate and glass to mortar and grout. Studio visits are a great way to see my work and envision a way to incorporate it into your own space. 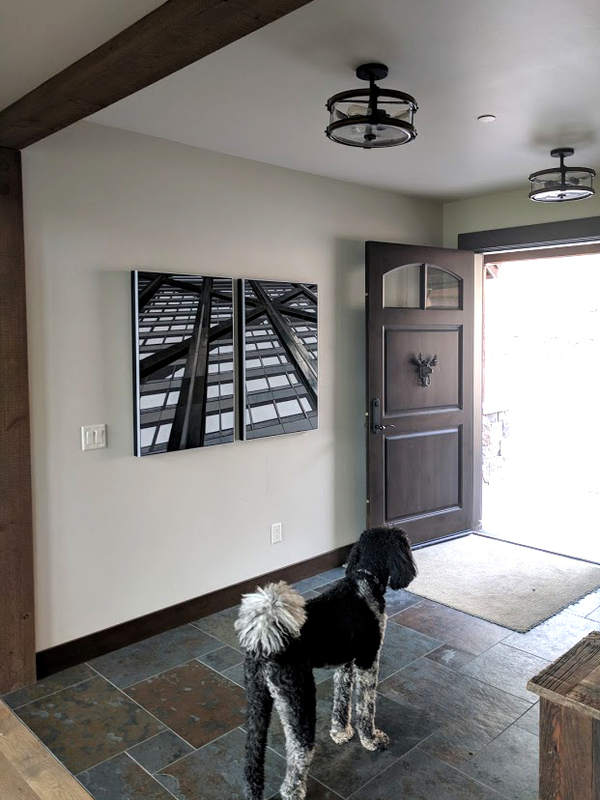 Reflect 4.1 was recently installed in the entrance of a gorgeous mountain home. The clients liked the idea of Reflect providing a visual experience that evokes mountain landscapes, a sort of urban mountain. The clients were looking for a statement piece for the entry way in their new construction mountain lodge. The entry way leads into a great room with a spectacular view of Lone Peak mountain. Architecturally, the home is contemporary mountain. 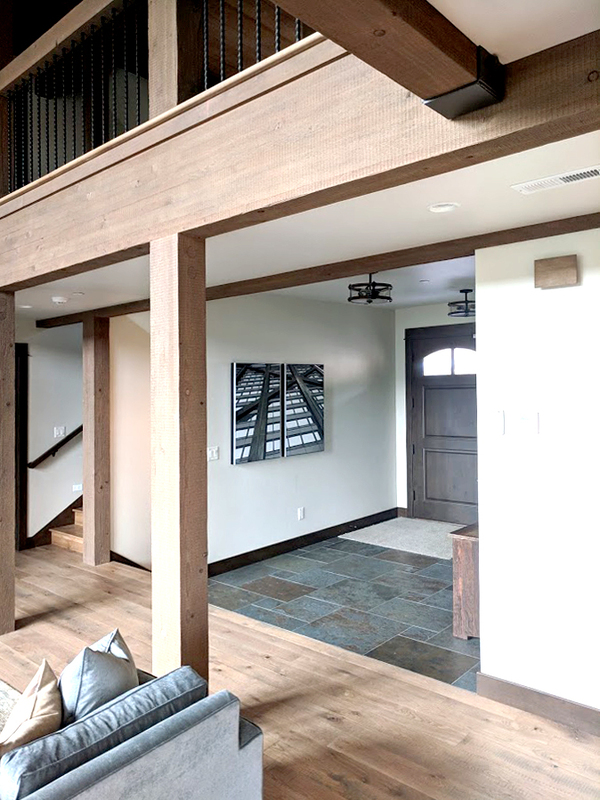 Wood beams provide visual interest and clean linear elements throughout the home. With a dropped ceiling in the entrance, they wanted to get the right scale for the space. 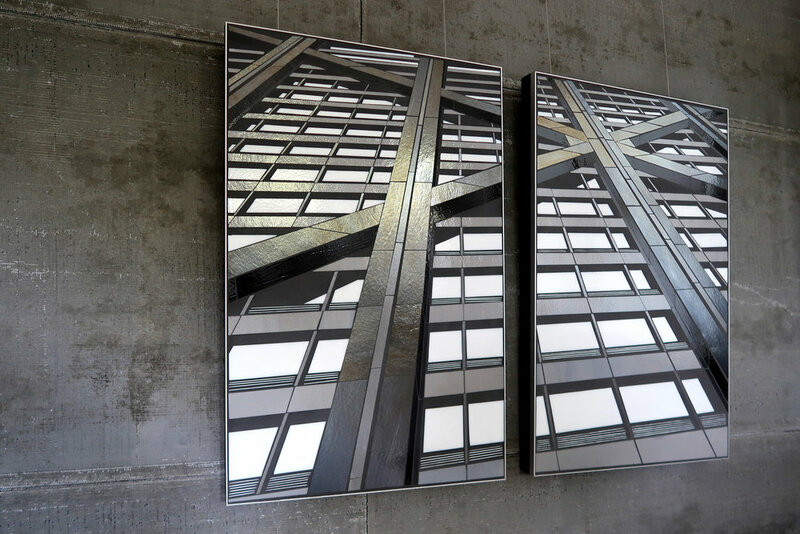 A diptych with two pieces at 24"x38" provides a bold shimmering visual experience and prepares viewers for the spectacular mountain views in the great room. The clients are delighted with the new connection between their urban city life and their mountain retreat. Alongside my abstracted architectural series Reflect I've recently come back to my Scan series. 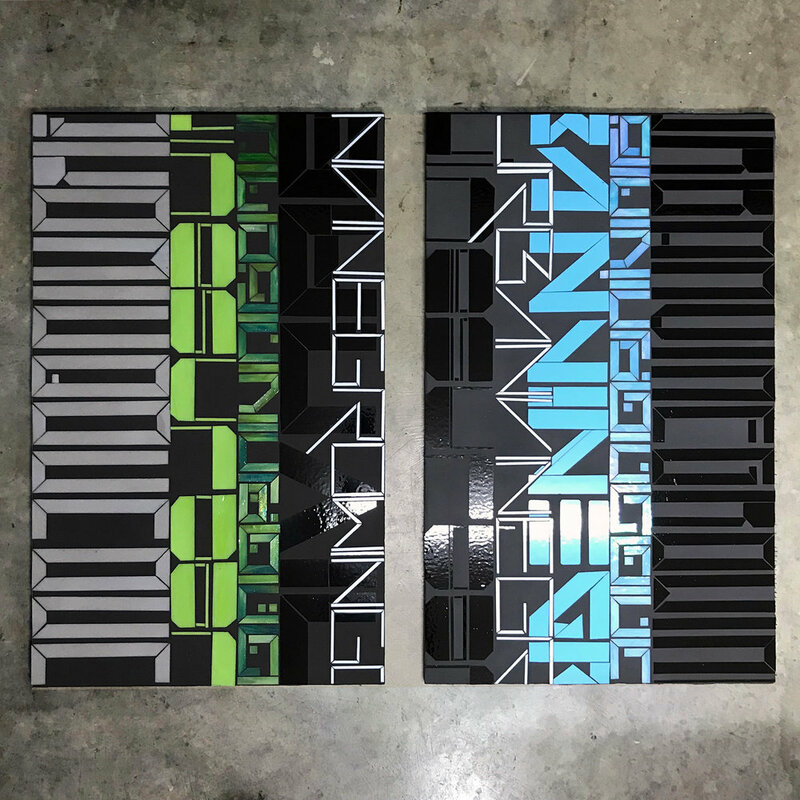 Abstracted letter forms engage our innate interest in decoding information. This series considers the constant processing--scanning--of information in daily life. This is a fundamentally optimistic perspective with abstracted text re-imagined as a thriving vine with limitless potential. I'm using a grayscale palette with single or layered color accents. The concept is endlessly versatile. Content and palette can be customized for a site-specific art feature. Heather Hancock at the Evanston Art Center’s panel discussion on Light and Architecture. Heather Hancock’s stunning work at the Evanston Art Center’s “Catching Light: the Art of Architecture” is a lot of fun. 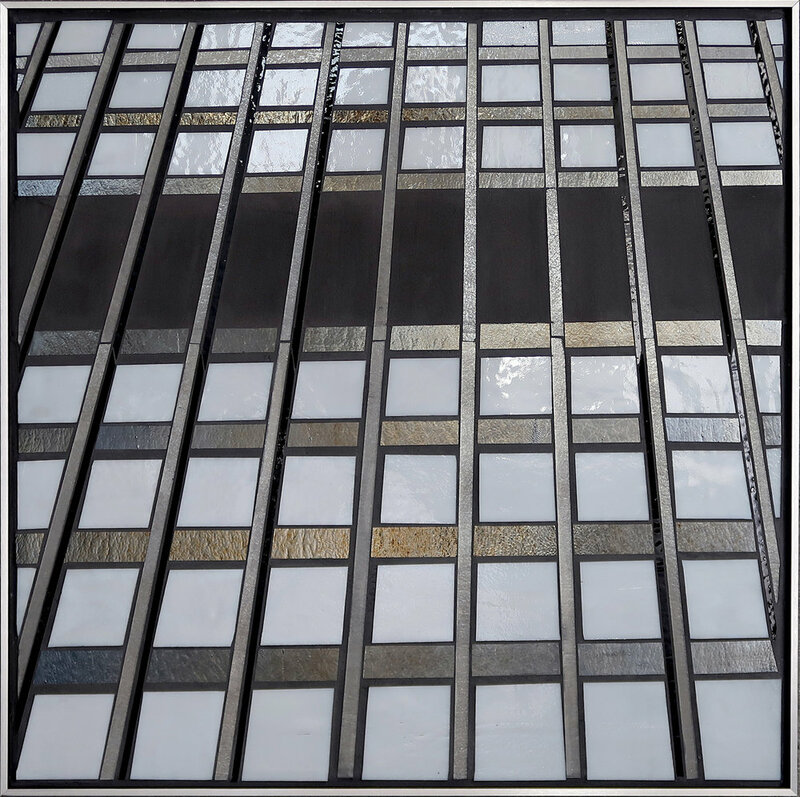 She presents the glass and steel facades of many famous Chicago high rises in an unexpected medium. The pieces appear from a distance to be photographs, but they turn out to be mixed-media with glass. The glass pieces shimmer and shine and reflect light in different ways, creating depth and richness within each piece. 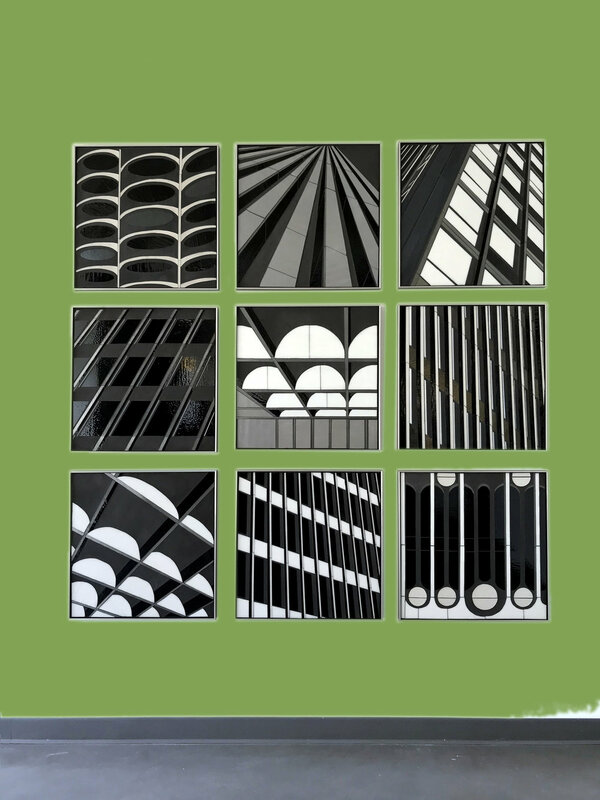 In addition, the thoughtful groupings of the pieces create another visual pleasure, as the curves and lines of individual pieces are juxtaposed. At a recent panel discussion sponsored by the Evanston Art Center, Ms. Hancock explained what has influenced her. Her background is in applied neuroscience, and her previous career – helping people with head injuries in the healthcare industry – led her to want to help people live well in a broader way, with access to art and design. 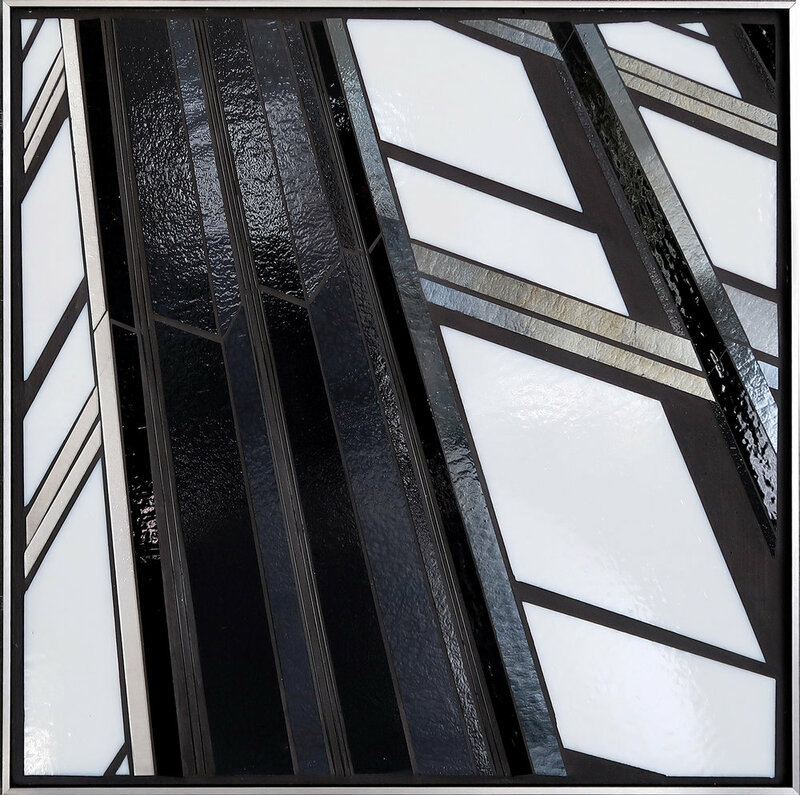 Ms. Hancock said she wanted to encourage people to think in new ways about their environments by engaging with materials such as glass that last “for millennia.” The hardness of these symbols of urban environments is softened by the design of these surprising glass compositions. Even grout becomes a medium for her in its own right. The pieces also suggest a painstaking process of execution. If one of the challenges of an artist is to make viewers look in a new way at what is familiar to them, Ms. Hancock has presented a body of work that does that in an arresting and rewarding way. 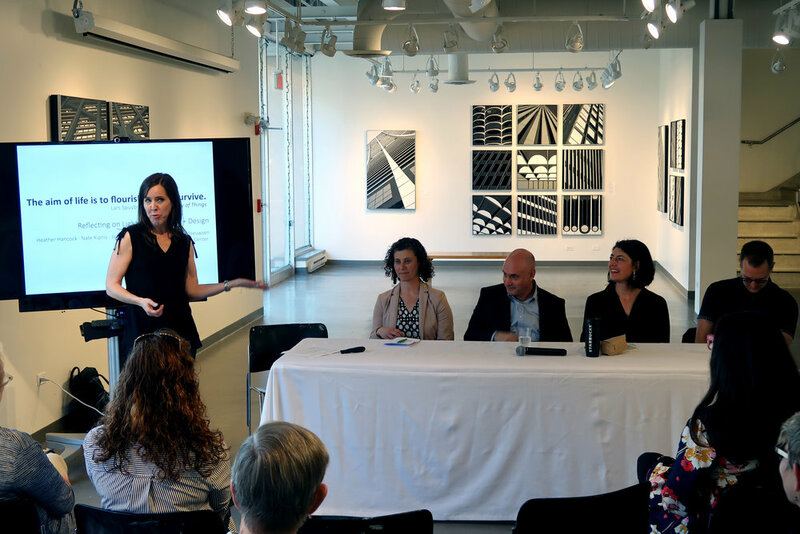 Joining Ms. Hancock at the recent EAC panel discussion were Jodi Mariano, urban designer at Teska Associates, Nathan Kipnis, architect, Pam Daniels, Assistant Professor at Northwestern University’s Segal Design Program, and Jeff Meeuwsen, Executive Director of Ragdale. Ms. Mariano mentioned her firm’s design of the new Fountain Square, with its movable chairs, inviting users to continually redesign the space. Mr. Kipnis designs solar homes that engage the client by using sunlight as both an aesthetic and technological asset. Ms. Daniels commented on the excitement of working with her students to create original design solutions. 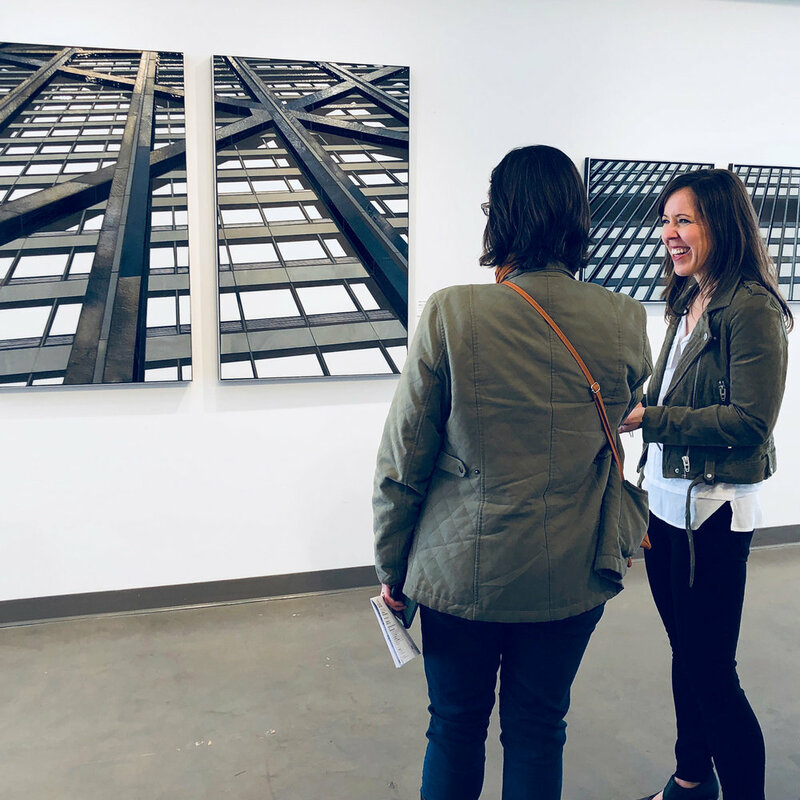 Heather Hancock’s Evanston Art Center show, along with its companion show, artist Jack Nixon’s impressive monumental architectural graphite drawings and etchings, helped viewers want to pause, look closely and flourish. 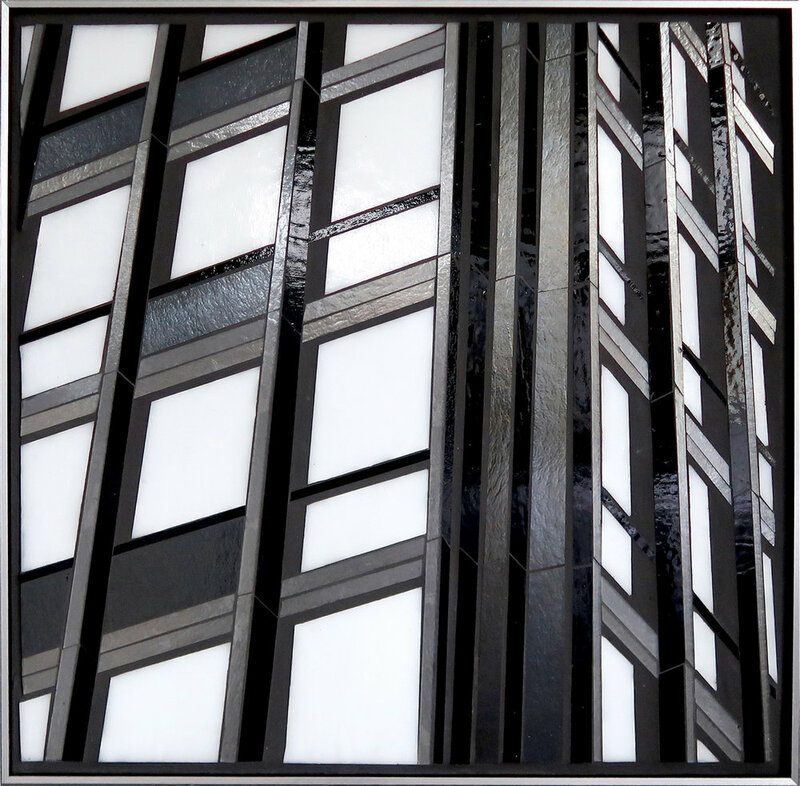 Heather Hancock finds natural forms in the facades of our “urban mountains” as inspiration for her mixed-media pieces. 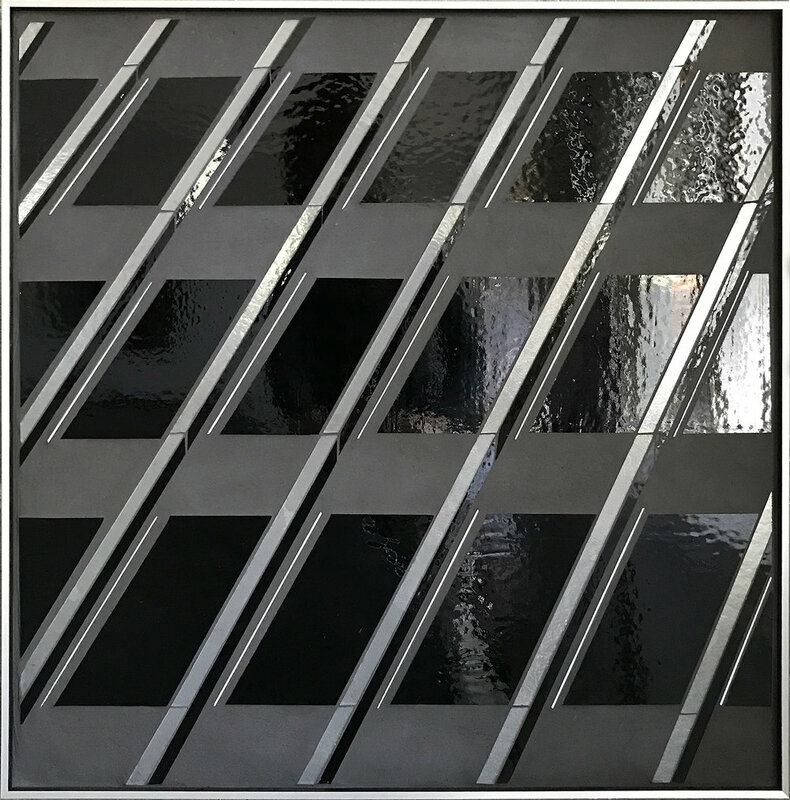 Art consultant Susan Blackman suggested thinking about a painted wall as a way to think about color with the grayscale Reflect grid. Evanston artist Heather Hancock has lived in the north suburb since 1993. She primarily works with glass and her creations are featured in a show through May 26 at Evanston Art Center. Q: What first brought you to Evanston? A: We moved here for my husband, Cam, to attend Northwestern. I was working as a speech language pathologist in Chicago-area hospitals. We found an amazing community of friends and are still here 25 years later. Q: How did you get involved with glasswork? A: I came to my art practice via a career in health care. I worked for more than a decade in physical rehabilitation. I was passionate about helping others “live well” but there was a limit to what we could do in the health care setting. I came to see how important our physical surroundings are to our well-being, that beauty matters. I saw glass while traveling in Europe. I started to experiment with this gorgeous durable medium and gradually came to understand how powerful glass is in creating an engaging visual experience. Q: How long have you been using glass as a medium? A: I first started experimenting with glass in the mid-90s and then left health care to focus on art full-time in 2004. Q: What do you enjoy most about working with glass? A: The best thing about working with glass is the way it catches light. Even a tiny glimmer of light brings glass to life. There’s this contradiction of glass being both fragile and impossibly strong. The interplay of glass and light is so ephemeral but the pieces themselves are enduring. Q: What frustrates you most about working with glass? A: There are plenty of shapes that can’t be hand cut in glass. So I’m always translating what I can envision into what can be cut in glass. And then it’s very challenging to photograph glass. Photographs freeze light but my work is about playing with light. You really have to see glass in person to understand it. Q: Does living in Evanston affect your work at all? A: Definitely. Evanston is the perfect balance of nature and city for me. Alongside the precision lines and repetition in our cityscape, I notice the constant change and transformations of our gorgeous lake and urban forest. I take a lot of pictures around Evanston. Beyond defining my own aesthetics, Evanston is a great place to be a working artist. This is a thriving creative and entrepreneurial community. I have an ever growing network of artists and mentors, collectors and creative entrepreneurs. Q: Where did you draw the inspiration for your current show at Evanston Art Center? 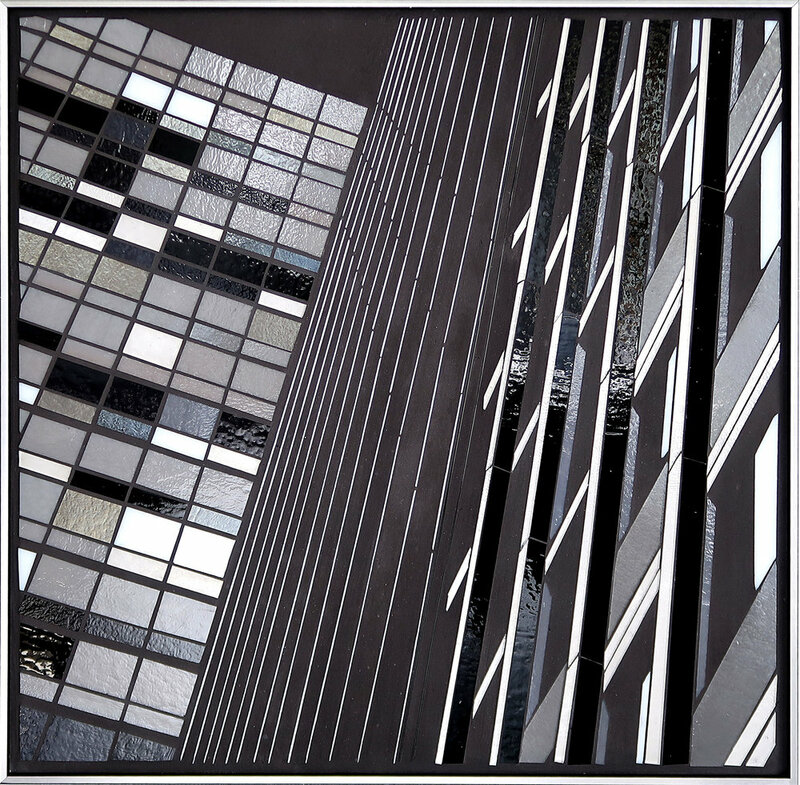 A: My current work, “Reflect”, explores urban beauty. Glass is everywhere in our city. 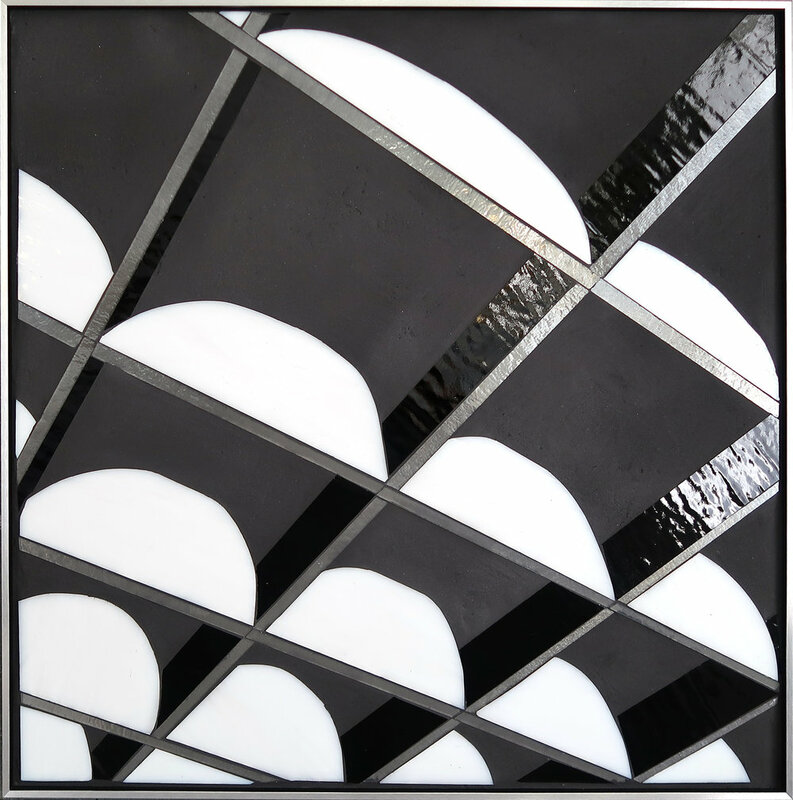 It catches light, reflects the sky and animates our streetscapes. “Reflect” is inspired by this overlooked urban beauty. I think that living well in urban settings requires new ways of seeing beauty and finding connections with the natural world. Q: What do you enjoy around Evanston when you're not working? A: Pretty much anything that gets us outside. Running at the lakefront. Lagging far behind our 13-year-old son Milo on bike trails. Our 17-year-old daughter Clio gets us out skating whenever winter weather cooperates and has recently introduced me to the wonders of a hammock. It's challenging to convey the dynamic experience of glass interacting with light and motion. Trying some video clips. 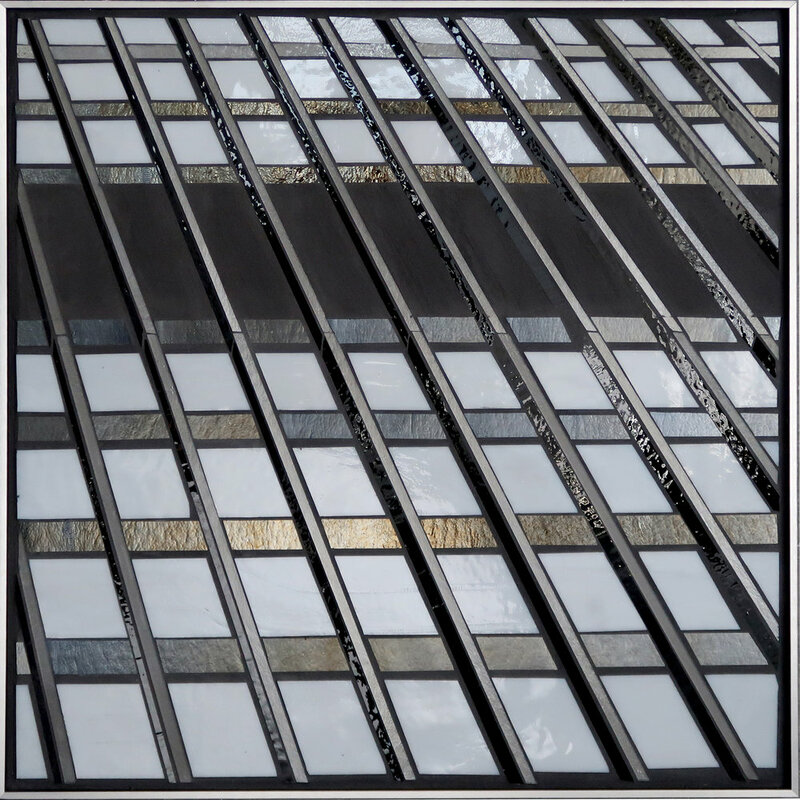 I enjoyed talking with Lisa D about my current show and work in architectural abstractions. Here's a short excerpt from our 20 minute conversation. Heather: …yes, and my work loves light. This is the perfect setting for my work. Video clips to capture how glass + light + motion interact. New work is all ready for the Evanston Art Center show which runs April 28th through May 26th. 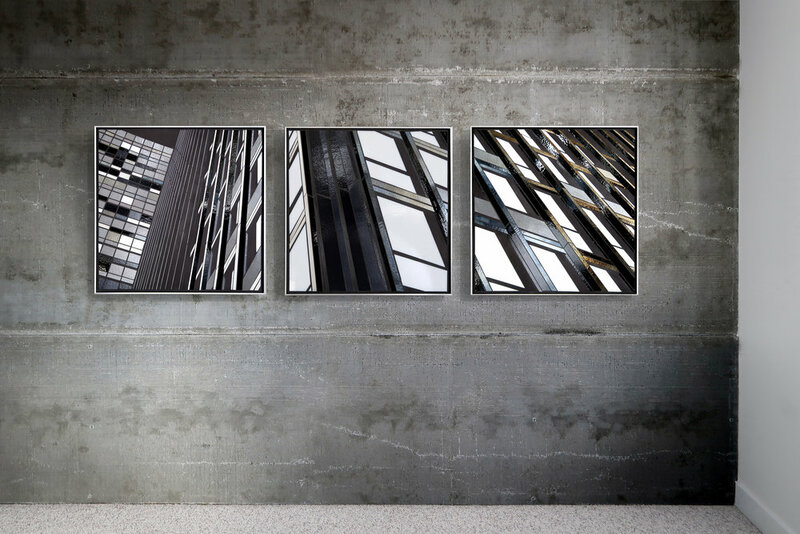 Large vertical pieces offer a big bold visual experience...almost like being there.